I haven't been doing a whole lot of cooking lately, I've been feeling a little under the weather--all I've been wanting to eat is okayu and umeboshi--Japanese American comfort food. Today I set out to make Chicken Pot Pie, but just didn't feel like eating that, so I decided to make some chicken soup. With rutabagas. I can't remember eating rutabagas when I was a little girl. 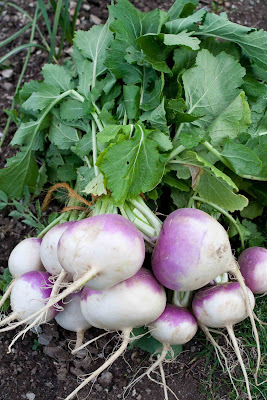 I remember eating turnips because my dad grows them, but I don't recall eating rutabagas. I didn't eat them until I was an adult. 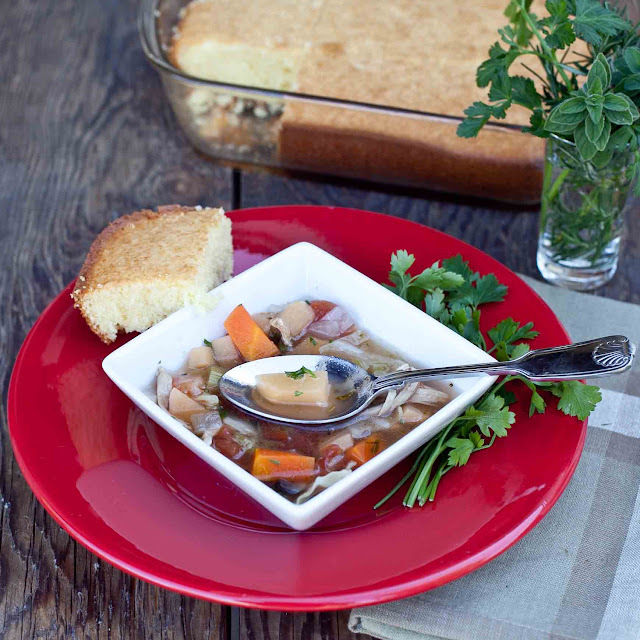 Rutabagas are good, they add a nice flavor to soups and stews--really adding depth to the broth. I'm sure this was not the freshest vegetable at my local grocery store--maybe there's not much call for rutabagas--I bought 3 anyway. Rutabagas are kind of special--and the name is also fun to say. 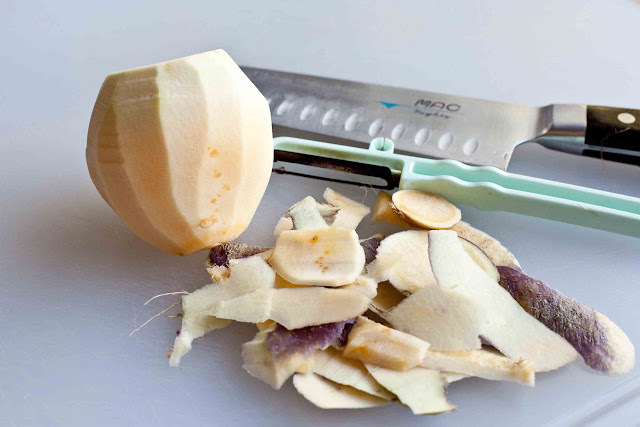 Peel the rutabaga--it can be eaten raw--it tastes a little like a turnip or kohlrabi. If you don't like to waste anything, save the peelings for when you're making stock. 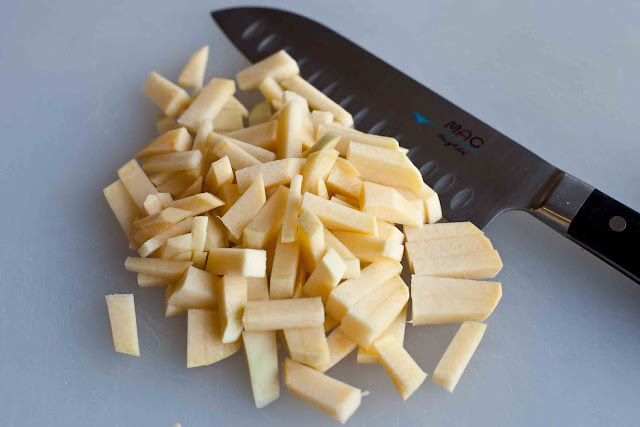 Slice it into pieces--it's not starchy like a potato. 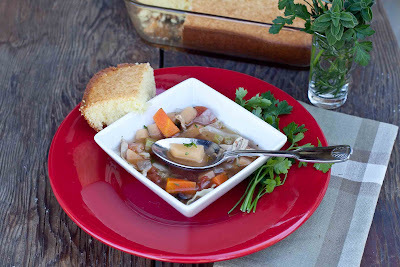 You can find a more thorough recipe for chicken soup on my Money Saving Chicken Soup post. I made a big pot of soup so I could share it with my son Rick--he's also feeling a little under the weather. Pull most of the skin off the cooked chicken. You could also use an uncooked chicken. 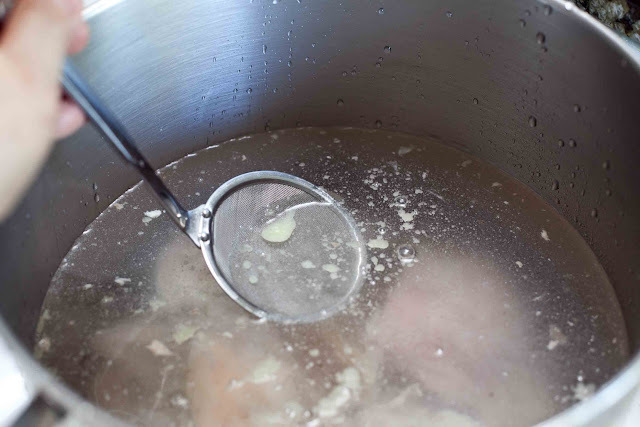 Add enough water to halfway fill a 12 quart pot, and skim off the fat that floats to the top. Bring to boil, reduce heat and simmer for about 15 to 20 minutes. 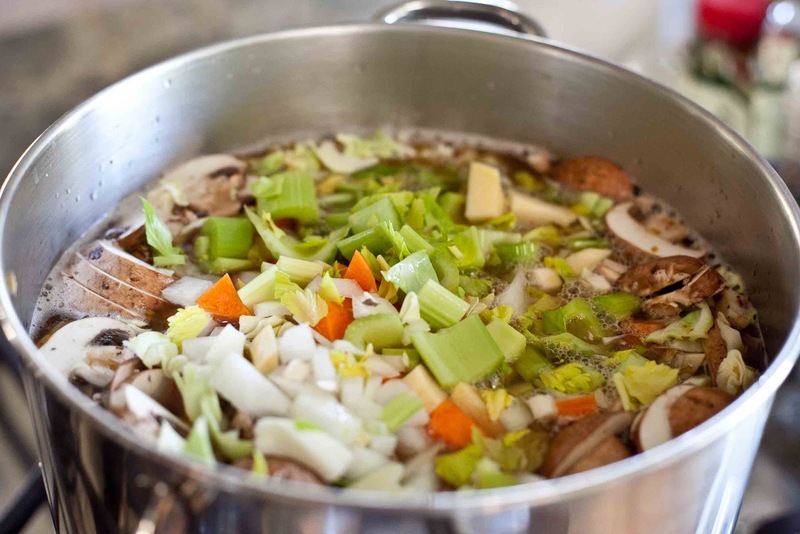 I always make a big pot of soup, you may want to make less, so adjust accordingly--the amounts aren't critical. I think the broth is the best part of the soup, so if you like the meat or vegetables more, use less water. What's going to make it good is to make it just how you like it. I also like to share some AND have leftovers, so I make a lot. Add the vegetables and simmer for another 15 minutes. 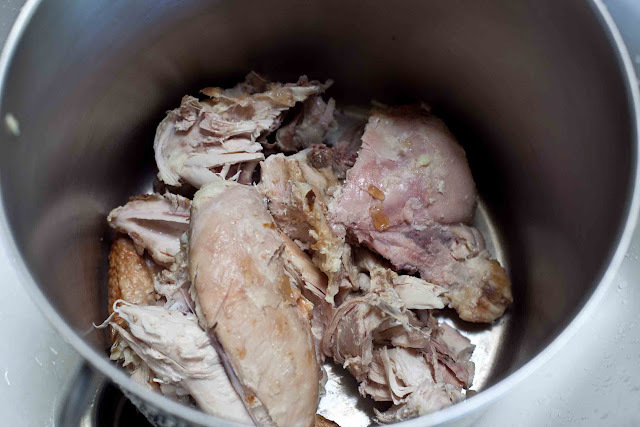 Remove the chicken and debone, coarsely shred, and add it back into the pot. Season to taste. Garnish with chopped parsley. I made some cornbread too. My husband is all smiles when he comes home and smells cornbread baking in the oven. A long time ago, an old timer in our Japanese community and also my friends' dad, George Taguchi, introduced me to rutabagas. You might remember his wife, Mrs. Taguchi, who made the best Chinese Chicken Salad from an earlier post. After Mrs. Taguchi passed on, sometimes I would make dinner for Mr. Taguchi since he lived alone, practically around the corner from me. That is how I was introduced to rutabagas--it was maybe about thirty years ago and to this day, whenever I think of rutabagas, I remember George Taguchi. I haven't been eating enough rutabagas. Remember this old picture from the...1960's? 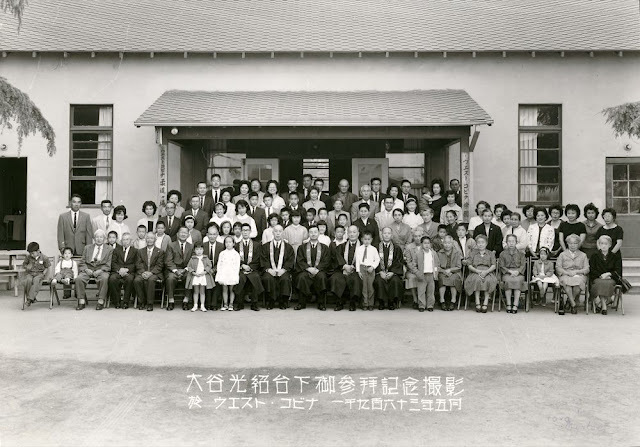 When I told you about our obon odori teacher, Mary Hatakeyama? Mr. Taguchi is in this picture, too! 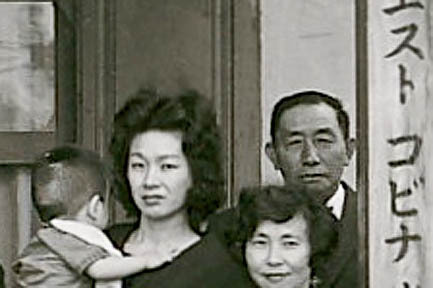 That's Mr. Taguchi--and right next to him is my mom holding my little brother, Ken. I remember my dad saying that Mr. Taguchi and my grandfather were friends, so our families go back a long way. Mr. Taguchi had a great sense of humor--I like to think that's where his children and grandchildren get theirs--they're all really funny and I always have a good time with them. Mr. Taguchi was a farmer (like my grandfather and father) and grew Chinese vegetables. His son Benny joined him under Tag Farms and then his son Joe took over. Joe is the one I worked for at the Farmer's Markets--Taguchi Farms. Mr. Taguchi was so nice to make dinner for me, not an easy feat by the looks of the mess he was making in the kitchen--we chatted a little while I helped him clean up and wipe the splatter off the wall while his exuberant rescue Bruno ran in and out of the kitchen. After he got all the vegetables into the pot, he told me to come back in 2 hours and the stew would be done. It was the best beef stew I've ever eaten. This is a bunch of turnips my dad grew and delivered to my door. 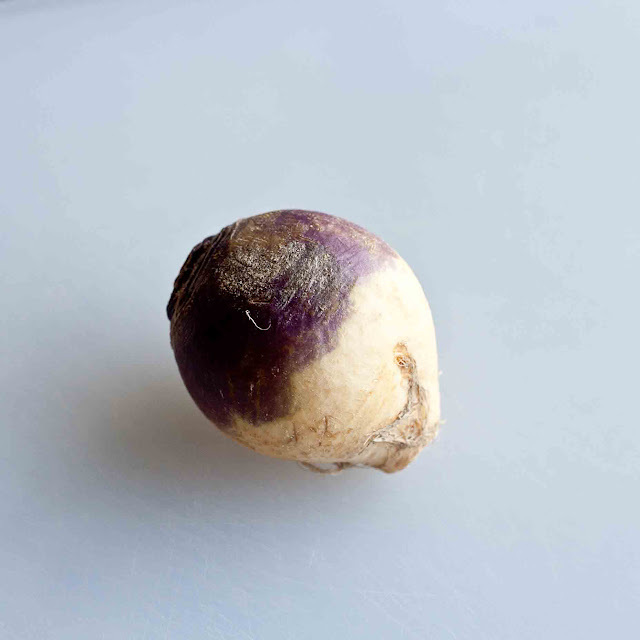 Rutabagas are similar to turnips, but the ones I found at my grocery store looked not nearly this fresh! Don't forget to enter our Giveaway, you can enter until the Lunar New Year, January 23rd, 2012! Pull most of the skin off the cooked chicken, and put into a large pot. Add enough water to halfway fill a 12 quart pot, and skim off the fat that floats to the top. Bring to boil, reduce heat and simmer for about 15 to 20 minutes. Add the vegetables and simmer for another 15 minutes. 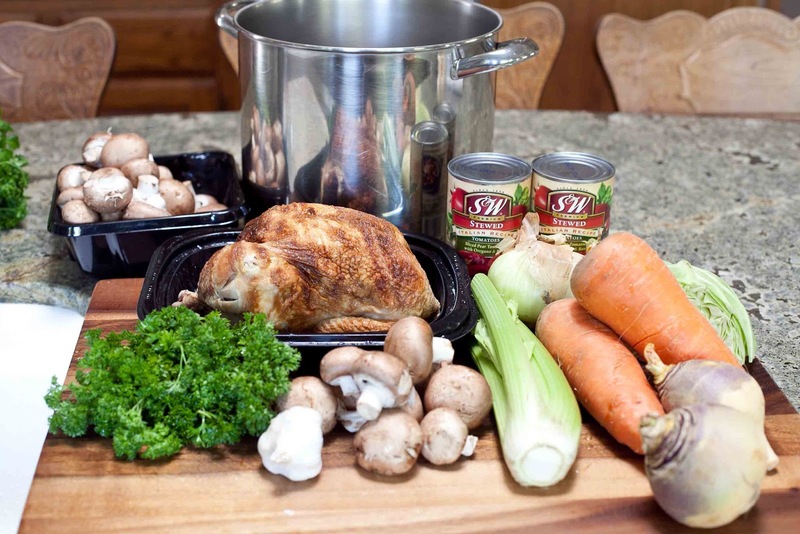 Remove the chicken and debone, coarsely shred, and add back into the pot. Season to taste. Garnish with chopped parsley. Serve with cornbread or crusty bread.